The ETP Store solution is flexible enough to integrate with a wide range of payment systems electronically, including all the well-known credit card, debit card, cash card, PayPal, online payment systems (online wallets) and mobile payment systems (mobile wallets). 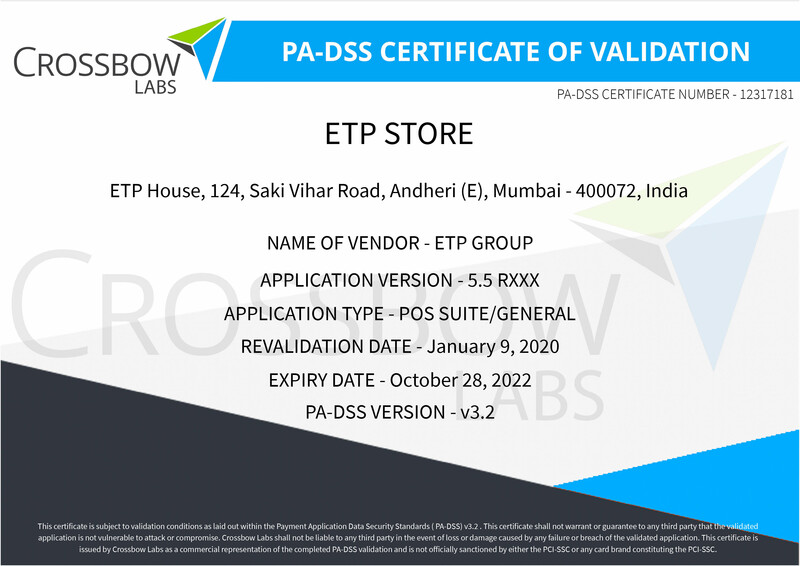 The ETP V5 Suite consisting of omni-channel retail management solutions is certified as Payment Application Data Security Standard (PA-DSS) v3.2 compliant by the Payment Card Industry Security Standards Council (PCI SSC). PA-DSS is a subset of the Payment Card Industry, Data Security Standard (PCI DSS) which is an association of credit card providers who publish security standards for parties who handle credit card information. In order to ensure that all sensitive cardholder authentication data is secure, PCI requires merchants, banks, and all other parties that use a third-party application for processing payments to select one that meets the PA-DSS standard. Being compliant with the security standards, we make it easier for our customers around the world to apply for PCI PA-DSS certification, where the use of compliant software solutions is a key element of demonstrating their ability to protect sensitive card data.